This excerpt from chapter 3 of Ice Cream Social describes the 1988 board meeting that produced the company’s first mission statement. The late Henry Morgan’s first draft of the statement is reproduced above. “The meetings and interviews [Phil] Mirvis facilitated did not end the division on the board, but they did shine a constructive light on the issues. As board members and managers took turns voicing their concerns, Henry Morgan noticed that they were saying the same things over and over. Many of them returned to an idea that one manager, Dave Barash, called ‘linked prosperity.’ The idea was that as the company grew, the benefits would be distributed not only to shareholders but to employees and the community. Each group’s interests were intertwined with the others. “The idea of linked prosperity got to the core issue facing the company. 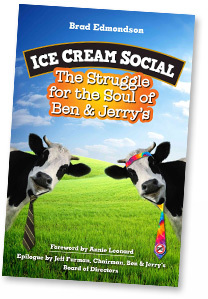 Ben & Jerry’s was looking for ways to advance a social mission and an economic mission simultaneously, without putting either of them first. As the social mission evolved over the next twenty-five years, Ben & Jerry’s would struggle to integrate its financial and social bottom lines and to create synergy by combining profit-making with community building. Maintaining this creative tension was and still is the most challenging aspect of managing Ben & Jerry’s, and it’s also what makes the company different. “Ben & Jerry’s is dedicated to the creation and demonstration of a new corporate concept of linked prosperity. Our mission consists of three interrelated parts. The PRODUCT MISSION is to make, distribute, and sell the finest quality all-natural ice cream and related products in a wide variety of innovative flavors made from Vermont dairy products. The SOCIAL MISSION is to operate the company in a way that actively recognizes the central role that business plays in the structure of society by initiating innovative ways to improve the quality of life of a broad community: local, national, and international. The ECONOMIC MISSION is to operate the company on a sound financial basis of profitable growth, increasing value for our shareholders and creating career opportunities and financial rewards for our employees. Underlying the mission of Ben & Jerry’s is the determination to seek new and creative ways of addressing all three parts, while holding a deep respect for individuals, inside and outside the company, and for the communities of which they are a part. “The success of Ben & Jerry’s would depend on whether the tensions that would inevitably arise from balancing those three parts could be converted into creative energy. It would take another two decades of struggle before the company found a way to generate that creativity in a consistent way. Only one of those decades would include Ben and Jerry.